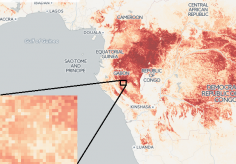 Predicting when and where pathogens will emerge is difficult, yet, as shown by the recent Ebola and Zika epidemics, effective and timely responses are key. It is therefore crucial to transition from reactive to proactive responses for these pathogens. To better identify priorities for outbreak mitigation and prevention, we developed a cohesive framework combining disparate methods and data sources, and assessed subnational pandemic potential for four viral hemorrhagic fevers in Africa, Crimean–Congo hemorrhagic fever, Ebola virus disease, Lassa fever, and Marburg virus disease. In this multistage analysis, we quantified three stages underlying the potential of widespread viral hemorrhagic fever epidemics. Environmental suitability maps were used to define stage 1, index-case potential, which assesses populations at risk of infection due to spillover from zoonotic hosts or vectors, identifying where index cases could present. Stage 2, outbreak potential, iterates upon an existing framework, the Index for Risk Management, to measure potential for secondary spread in people within specific communities. For stage 3, epidemic potential, we combined local and international scale connectivity assessments with stage 2 to evaluate possible spread of local outbreaks nationally, regionally, and internationally. We found epidemic potential to vary within Africa, with regions where viral hemorrhagic fever outbreaks have previously occurred (e.g., western Africa) and areas currently considered non-endemic (e.g., Cameroon and Ethiopia) both ranking highly. Tracking transitions between stages showed how an index case can escalate into a widespread epidemic in the absence of intervention (e.g., Nigeria and Guinea). Our analysis showed Chad, Somalia, and South Sudan to be highly susceptible to any outbreak at subnational levels. Our analysis provides a unified assessment of potential epidemic trajectories, with the aim of allowing national and international agencies to pre-emptively evaluate needs and target resources. Within each country, our framework identifies at-risk subnational locations in which to improve surveillance, diagnostic capabilities, and health systems in parallel with the design of policies for optimal responses at each stage. In conjunction with pandemic preparedness activities, assessments such as ours can identify regions where needs and provisions do not align, and thus should be targeted for future strengthening and support. Pigott DM, Deshpande A, Letourneau I, Morozoff C, Reiner Jr RC, Kraemer MUG, Brent SE, Bogoch II, Khan K, Biehl MH, Burstein R, Earl L, Fullman N, Messina JP, Mylne AQN, Moyes CL, Shearer FM, Bhatt S, Brady OJ, Gething PW, Weiss DJ, Tatem AJ, Caley L, De Groeve T, Vernaccini L, Golding N, Horby P, Kuhn JH, Laney SJ, Ng E, Piot P, Sankoh O, Murray CJL, Hay SI. Local, national, and regional viral haemorrhagic fever pandemic potential in Africa: a multistage analysis. The Lancet. 11 Oct 2017.